Drakenstein Stud’s multiple Equus Champion What A Winter, South Africa’s Leading First Crop Sire of 2016-2017, was represented by his first G1 winner when his brilliant 3yo daughter Clouds Unfold scored a devastating win in the G1 Bidvest Majorca Stakes at Kenilworth on Saturday. Bred and owned by Drakenstein Stud, the flashy chestnut stormed home from off the pace to register a one and a half length win in the 1600m contest. Clouds Unfold, who accounted for all of Equus Champion Lady In Black, 2018 G1 WSB Cape Fillies Guineas winner Front And Centre and multiple G1 winner Snowdance when winning the R1 000 000 Majorca Stakes, has now won six of only eight races, with Saturday’s win taking her earnings to R1 458 125. Ridden to victory by Aldo Domeyer, Clouds Unfold is trained by Candice Bass-Robinson –whose father Mike trained What A Winter himself. 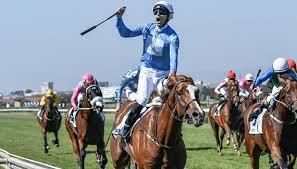 South Africa’s latest star filly has now won four graded stakes, with Clouds Unfold’s previous graded successes including the G2 Western Cape Fillies Championship, G2 Cartier Sceptre Stakes and G3 Cape Of Good Hope Nursery. The filly was one of three winners on the weekend, and one of two on Saturday, for What A Winter, whose Lammerskraal Stud bred son Russet Air dead-heated for victory in Kenilworth’s final race on the day -the TAB MR 87 handicap over 1000m (another son of What A Winter, What A Winner, ran fourth in that race). Also trained by Candice Bass-Robinson, the lightly raced 3yo Russet Air has now won or placed in four of only five outings and was second, at his previous start, in the Need For Speed Sprint behind talented Sophomore Sprint winner Pleasedtomeetyou. Clouds Unfold, who also previously finished third in the recent G1 WSB Cape Fillies Guineas, was one of three winners over the weekend for her four time G1 winning sire What A Winter, whose Listed East Cape Nursery winning son Fort Winter got up to score over 1000m for trainer Yvette Bremner and jockey Ryan Munger on Friday. What A Winter, whose stellar first crop included high class graded stakes winners Magical Wonderland and Dutch Philip, also enjoyed success at last week’s Cape Premier Yearling Sale where his yearlings fetched up to R700 000.